I just discovered that They’re Everywhere, the album featuring the Flash-themed song, “The Ballad of Barry Allen,” is now available on Amazon’s MP3 store. 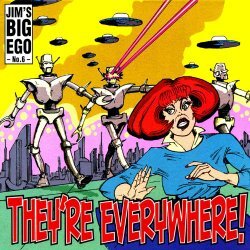 The band, Jim’s Big Ego, is headed by the nephew of legendary Flash artist Carmine Infantino, who did the cover artwork on the album. And yes, the song’s actually good! It’s been available on iTunes (which is how I originally bought it) and CD before, but it’s worth mentioning since Amazon’s music downloads, like Slabster’s, are just plain MP3s. No DRM, no account activation, no need to authorize computers or stick with one company’s player—hardware or software. This entry was posted in Comics, Music and tagged Amazon, Carmine Infantino, Flash on December 26, 2007 by Kelson.